It Makes a Great Gift, Too! This attractive scissors case looks complicated but it’s really quite simple to make. Create a little quilt from two squares of fabric, batting and binding then fold it just so. A button and loop closure secures the scissors. Choose a lovely vintage button and a matching hair elastic or ribbon for the loop. The case will be lovely in any pleasing color combination. Have fun selecting fabrics for all your scissors. 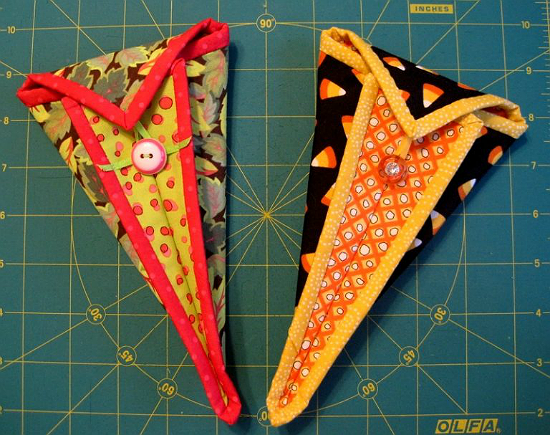 These make wonderful gifts for quilting and sewing friends, too, as well as quilt group projects. Instructions are provided, by Dawn from First Light Designs, for adapting the size to fit any pair of scissors. 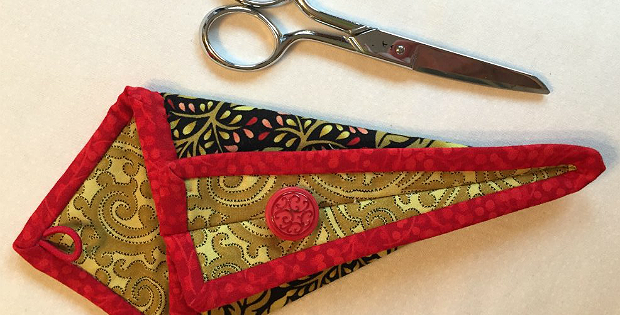 Click here for the free “Scissors Case” tutorial.